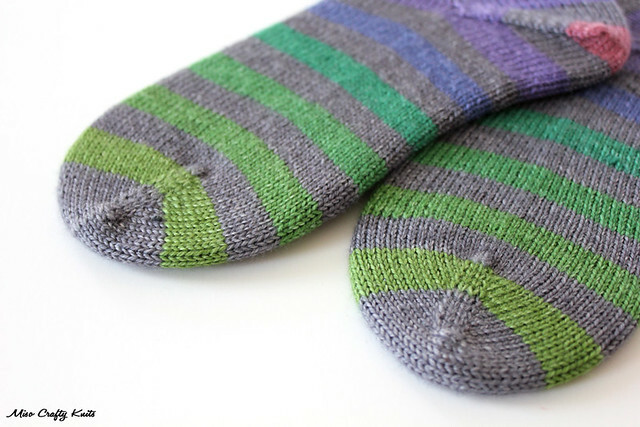 Miso Crafty Knits: Concrete & Tulips and a CaterpillarGreen Yarns Giveaway! Concrete & Tulips and a CaterpillarGreen Yarns Giveaway! Holy smokes! Is this a post about a finished pair of socks?? Why yes, yes it is. A quick peek at previous sock related posts suggests that I've been knitting on a lot of socks but there hasn't been a post since February that present any actual finished sock. Well, here you go. Here's a finished pair of socks. There's more, trust me. But these ones in particular make me overly happy. And how could they not? They're stripe-y, they're colourful, they're made with the softest of MCN yarns, and they fit perfectly. As per usual with self-striping yarns, I went with my go-to plain vanilla toe-up sock with afterthought heel recipe. This kind of mindless knit usually works up fast for me as I'm always wanting to knit "just one more stripe". Although I have to admit that I probably spent more time admiring the yarn, the sock, and the stripes than I did knitting. But can you blame me? Just look at this yumminess! I'm pretty darned pleased with myself for taking the time to measure out my yarn before the first green stripe so that the pair could be somewhat identical. I think I did a bang on job too. I did mess up on the heel the first time around (well...ok...not really 'messed up' per se, more like I didn't like how the stripes played out when it came time to graft my heel together) but it all worked out in the end without losing too much knitting time. This yarn was such a pleasure to work with that I honestly didn't mind ripping out and re-knitting the heel a few times. When it comes to plain vanilla socks there's usually no need for mods, but this time I did a teeny, tiny little one - on the cuff. To avoid the unsightly purl bumps of contrasting colour when the stripes changed from grey to a colour (in my case that would be green), I stopped knitting in the 2x2 ribbing pattern and would just knit all the stitches until all the stitches on the needles were in the new colour, then I'd switch back to ribbing. 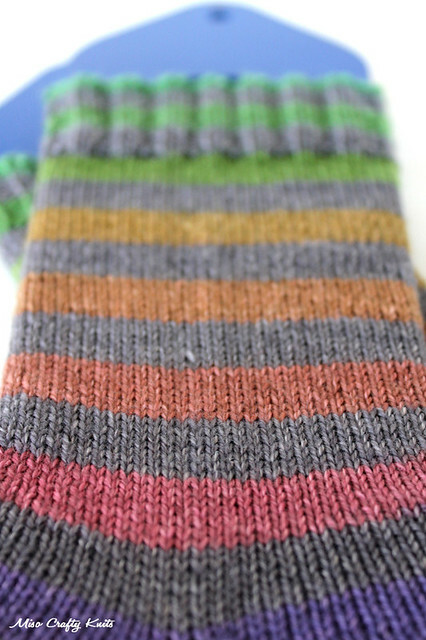 This little mod is more for the nit-picky perfectionist knitter but I figured that if I already went through the trouble to get my stripes lined up and to make the pair identical, then I might as well go all out knitterly crazy. For the record: I'm generally not this picky when it comes to my stripes. At least I don't think so. I do like to cast on my socks and start them with the same colour but never to the point where I take such actions like measuring out my tail and the amount of yarn I have until the first stripe. The only time I've ever done that was for my Hudson socks, but I think those were a special case in which mismatched and noticeably uneven stripes would just make the final product look sloppy. These little details are definitely things that no one would notice but me. Little things that no one would care about but me. And you know what? I get that. But I'm also the one wearing these. Every knitter and crafter has their own little quirk and things that they can and can't handle. This is mine. Sometimes I pay way too much attention to detail and can drive myself nuts with something as minute as a wonky stitch, a tiny gap...it's even worse when it comes to sewing - uneven topstitching makes me cringe and 99% of the time I have to force myself to look the other way when I spot a single stitch is a little off. Yet it doesn't bother me in the least when I see this type of stuff on other people's work. Crazy, right? I have a good amount of yarn leftover. I had originally planned to knit up every last bit of yarn until I realized that going that route would result in the most awkward of lengths - I'm short but not short enough that one skein of yarn could produce knee-high socks. Next time (trust me, there will be a lot of next times when it comes to knitting with CaterpillarGreen Yarns!) I think I'll either nab an accent skein (I love how Catherine, the dyer of CaterpillarGreen Yarns, dyes up the accent skeins to ensure the yarns are from the same dye lot) or splurge and get CaterpillarGreen Yarns newest addition to their product line-up: the behemoth XL hank that is 548 metres (599 yds) or 170g for those of you who think in grams, of pure self-striping yumminess!! You can squeak out 2 pair of socks with that amount! Or, if you're of average height, a pair of knee-high socks without worry of running out of yarn! Before this pair of socks I've knit with one other CaterpillarGreen Yarns, in the Ocean Sunset colourway (a project that I have yet to blog about, oops!). The yarn itself was so, so soft and smooth to knit with and the colours were such a treat to watch as they gradually changed from one hue to another. CaterpillarGreen Yarns specializes in self-striping yarns - some colourways are the usual thick stripes of colour, some are long colour repeats, and some utilize both the thick stripes and long repeats (like in the Finger Paint colourway, which I can't wait to get my hands on!). I first heard of and met Catherine of CaterpillarGreen Yarns at last year's Fibrations event and by the time I got to her booth (sadly, at the very end of the day!) it was completely raided with only a few skeins left (which is awesome for Cat!). I walked away with a skein of Ocean Sunset and it took me forever to decide what that skein should be. I'm super excited that Catherine will be back at Fibrations this year, and you can bet that I'll be stopping by her booth first thing and that I'll be stocking up (I have my heart on scoring at least 4 skeins)!! So watch out if you get between me and the CaterpillarGreen booth!! I'm also really excited to hear that Catherine has been working on a self-striping shawl yarn and can't wait to get my hands on a skein when she does finally release it. I think it's going to be glorious! 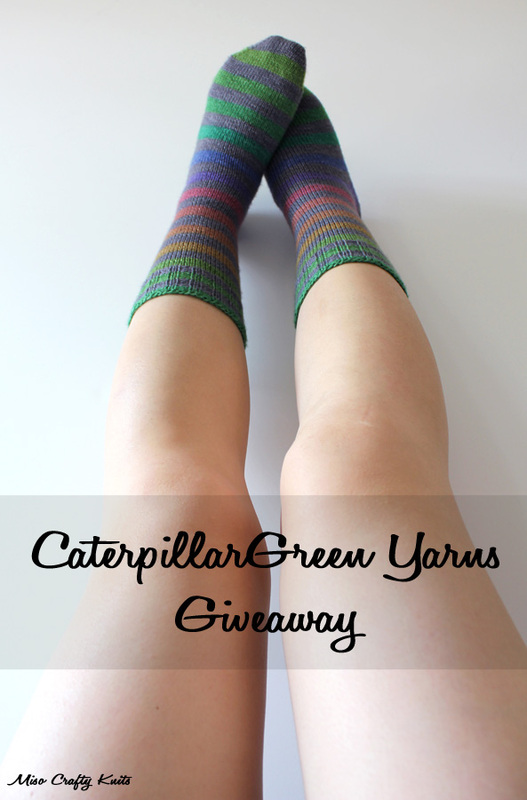 I know a fair amount of people have been eyeballing both the CaterpillarGreen Yarns website and my Concrete & Tulips socks, so here's your chance to win a skein of your very own! One lucky winner will receive a regular skein (that's 115g of yummy yarn) of their choice from CaterpillarGreen Yarns AND an accent skein, if desired. :: The giveaway is open to everyone (yay!!). :: The giveaway is open until Monday, June 30, 2014 at 11:00pm PST. :: All comments must include either a valid email address or Ravelry ID so that I can contact you if you are the winner. :: Check out the CaterpillarGreen Yarns shop, then leave a comment below and let me know which colourway is your favourite and which one you'd pick if you were the winner (in case you already own your favourite!). Loooove your concrete and tulips!! Wow, this giveaway is AWESOME! I looove your finished socks, and I think the attention to detail is amazing. I especially love the idea to knit a row to avoid the colour-change-purl-bumps situation in ribbing - genius! For the giveaway, I think I would choose Spectrum. I love Concrete and Tulips, too, but this morning Spectrum is speaking my language! My rav name is SarahVV - thanks to you and Catherine for running this contest! Your socks turned out AWESOME! I'm at that same awkward height regarding knee socks/not-so knee socks, so I would definitely choose Concrete & Tulips with a gray accent so that I could make that knee sock dream a reality! I love stripey socks!! Even when you knit plain vanilla socks, the stripes keep you interested. That's a really hard decision.. Hmmm... can't chose between "Ocean Sunset" and "Warm and Fuzzy". I love orange so I guess I'd swing more towards the "Warm and Fuzzy" colorway. Plus, I like the name! Such beautiful yarns I LOVE Concrete and Tulips AND Ocean Sunset. If I won I think I would choose Concrete and Tulips. Oh wow! Your socks turned out beautifully!! Well done!! I'm loving finger paint, G Biv, and Skyline. yay! Loving G Biv right now, just started my second set of sock with it! However if I got a new skein it would be Finger paint for sure! I already have skyline and concrete and tulips. Catherine was awesome enough to rush me my order for some 'so you don't get cold feet' socks for my fiance for our wedding!! I think i'd go for spectrum or gbiv. :) I'm dianatpham on ravelry. Wow, concrete and tulips or spectrum are my favorites! I have never knit with this yarn but I have enjoyed seeing your progress. I love spectrum!! Your socks make me really want Concrete and Tulips (and your heels! They are a thing of wonder!) but I have some baby boy knitting to do, which would lead me to choose Spectrum. Now I need to make sure not to book my out-of-town vacation on Fibrations weekend this year. I already ordered Spectrum and Hillside, but naturally I would still kill for a Concrete and Tulips. Well, not kill PEOPLE, but maybe some wool moths. You know what I mean . . . Rav name TheNekkidSheep. Hi there! This is a very inspiring pair of striped stocks. 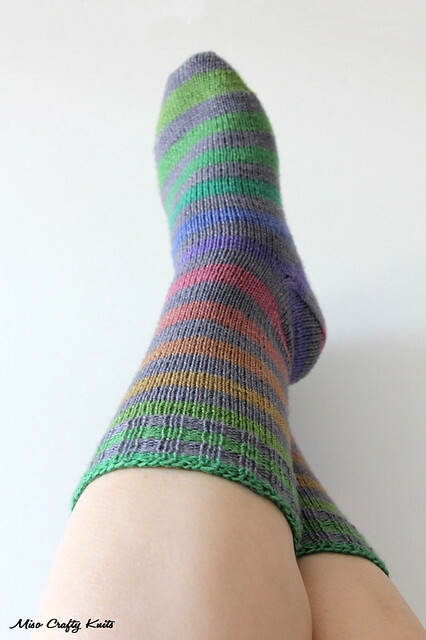 I've never worked with self-striping yarn before, and would love to give it a try. If I won, I would pick the Hillside colorway-- looks very delicious. :) I'm JudyNM on Ravelry. Thanks! Wow. That concrete / tulips is so awesome! 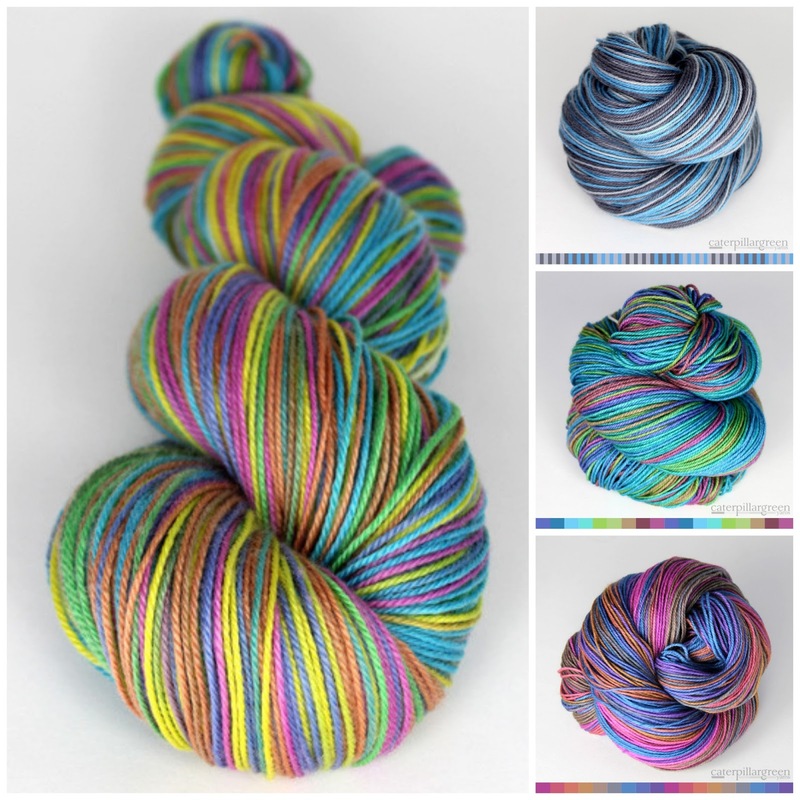 Skyline and fingerpaints are tied for me I think - such wonderful colorways. Your socks turned out great!!! What a generous giveaway! Love your socks! I've been wanting to try the spectrum colorway. Glad you're feeling better! I'd have to pick Concrete and Tulips too! Gorgeous! Beautiful socks & a great giveaway! All the colors are greatl, but I like Concrete and Tulips! I think I'd choose Fingerpaint or G Biv...but they're all so beautiful!!! How do you like your Karbonz needles for socks? I love love love the Hillside color way! This is so amazing, since I was just drooling over these yarns yesterday. It would be an absolute dream to win! I would pick Concrete and Tulips or Skyline. Thanks so much for the opportunity! I love Concrete and Tulips Colourway, Yours are gorgeous. Definitely Concrete and Tulips! I'm so in love with this color way. I'd love to try Earthy Hues or G Biv. Thank you Melissa and Catherine for this giveway! I'm polkadotknits on rav. I love them all - I keep going back to the website and checking them out since you first blogged about them! For just ONE favourite it is hard to choose between Concrete & Tulips or Warm&Fuzzy - I love the look of them both equally - but since I have to select just one (for these purposes) I'm going to have to say Warm&Fuzzy - just because they would definitely end up just for me then - due to the orange! Love orange! I'm on Ravelry as "auntytraci"
I've wanted to knit these socks for a while and just haven't had the time or the money to get the yarn. Its a toss up between G Biv and Concrete and Tulips for me (ejm331 on rav). I'd have to start with Concrete and Tulips, but to be perfectly honest, I kinda want them all! Amanda: I would love to have a skein of Concrete and Tulips. I've been eyeing it for ages. Rav ID knitinmountains. mememememeeee!! i've been wanting the skyline one for months but in the event of my actual winning i might go crazy and pick something more outrageous! LOVE the socks and the yarn! I would choose (today) Warm and Fuzzy, but tomorrow could be something else. Loved every single one! I am monicamg on Ravelry. All of the colorways are beautiful. But if I win I will choose Finger Paint. I don't have anything that colorful and yummy. I think hillside is my favorite--they are all quite lovely! Warm and Fuzzy looks nice! I'd pick that, never tried the yarn before. I've had my eye on spectrum for ages! And I would love an accent skein! Ooo contest! My son picked the G Biv colourway so I'll go with that since I can't decide for myself! And I am TOTALLY the same way when it comes to matching stripes and having tiny little 'defects'. Even when I know no-one is going to notice but me, and even I won't know unless I look for it, I still go back and fix those things... Hope your head is better! Fantastic giveaway! Concrete & Tulips is my first choice (but followed very closely by G Biv). YarnAndYarns on Ravelry. Thanks! Interesting giveaway! I lately been knitting lots of socks with the toe up and would love trying this yarn. Prefers Ocean sunset ...I read your blog every week! Hooked on socks!! Been loving your striped socks lately! There is too much awesome in this post! I love your socks and how perfectly they match. I totally get the picky-ness. I think it's because, with plain socks, there's nothing else to distract you, so you focus on getting all the little details just right. My favourite Caterpillargreen yarn is Concrete & Tulips, I think, though Hillside and Warm & Fuzzy are close behind. I love love love love this yarn!!! Been dying to buy some but have a hard time deciding!!! I'd love the concrete and tulips. My ravelry ID is justinemac. Hello! I'd love a skyline, only because I just slipped and ordered the concrete and tulips...Oops! Hillside is my absolute favourite! I love G Biv. So beautiful! blondecatalogue on Ravelry. I love the Concrete and Tulips colorway. I like all of them, but there is just something about the Concrete and Tulips colorway. Wow, thanks for the awesome giveaway, I have never tried this yarn before but I absolutely love how your socks turned out! I'd love to try either G Biv or Skyline if I won! I'm Stefaniegrrr on Ravelry! Concrete tulips :) but skyline is a close second. I'm vexy on rav. I love fingerpaint. I just finished knitting my first pair of socks. I'd love to do a pair with this yarn! I think Ocean Sunset is so pretty! Thanks! All the colors are gorgeous--but if I have to pick a favorite, I think it would be Spectrum. Love all the blues in it! My daughter would love the Ocean Sunset colors for the leis she is hand-crocheting. I have to say they are all gorgeous colors..it is very hard to choose any! I look at one & go that's nice stripes, then look at the next one, & say the same... all of them got the same response!! Narrowing it down was very hard, but Ocean Sunset is quite appealing!! 9crafty11 on rav! So hard to choose they are all amazing, I would pick concrete and tulips and g biv and spectrum would be my runners up......oh I forgot Ocean sunset and and and. Thank so much for the giveaway! i love love love skyline! greys and blues are super pretty together :D !!! I would choose Concrete and Tulips. It is gorgeous yarn! Wow, her yarns are absolutely stunning! It would be a hard choice but I would pick Hillside if I win. I love the colors and it's so cool how the stripes are different widths. So pretty!! Love Warm and Fuzzy. Fun colorways one and all though. Love all the colorways but Concrete and Tulips calls to me!! Thanks for the give a way!! What is the date that you wrote about interchangeable needles? I'd like to read it. The yarn looks amazing and the colours are gorgeous! It's hard to pick one favourite…I think mine would be ocean sunset. I am so excited, I have been eying this yarn for ages. I am torn between my own skein of Concrete and Tulips, or Spectrum. I love colorful socks, and they are both so yummy! G Biv and fingerpaint are both amazing! Actually, they all are! These are just the two that seem to be calling me today. Thanks for the opportunity! And hope you are feeling better! I'd go for the G Biv colorway with a purple accent skein for the heels and toes. A heel flap and gusset just fits my feet so much better than afterthought heels, but they do sometimes do funny things to the stripes, so the accent skein is the perfect solution. After seeing your socks I will have to go for concrete and tulips - with grey accent skein. Love love love. Thanks for a lovely blog. I look forward to each new post eagerly :-). Pygmina on ravelry. I love the Concrete and Tulips colorway. It is a perfect blend for a city girl like me! Thank you for the offer! All the colors are beautiful. I would pick hillside. It honestly took me 15 minutes to decide. Concrete and Tulips / Skyline / Concrete and Tulips/ Skyline. Oh I love both skyline and concrete and tulips! I love finger paint! Fun! Fun! spectrum!! I'm "peruseratlarge" in ravelry. What pretty yarn! I love the ocean sunset colorway! I love the Concrete and Tulips colorway! Beautiful socks! So confused! They are all so beautiful. Looking at finished projects on Ravelry doesn't even help. I think I'd pick Skyline. If I had to choose one I would pick G Biv. The colors are so cheery! Gee golly whiz! Ocean sunset is the loveliest of all the lovelies, but wow what a stunning selection! Coldtoesneedsocks on Rav. I like (and would pick) the Concrete and Tulips. Is this contest good in the USA? oh man, it's a tie between the tulips one you have and the ocean sunset! maybe I want a concrete sunset lol (i realllllly like the gray stripes) thanks for the giveaway!! It's a tie between Concrete and Tulips and Spectrum... Thank you both for the giveaway! 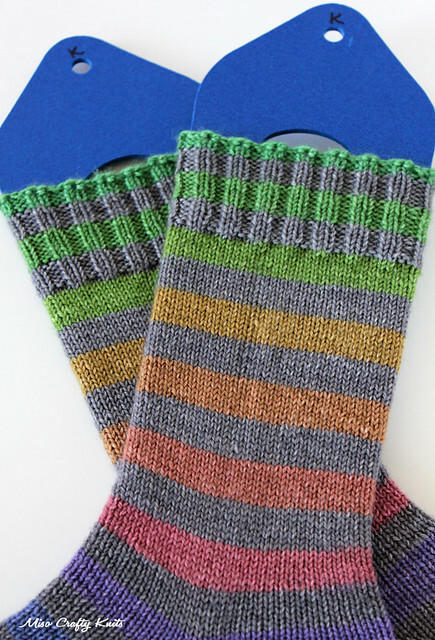 Such stunning socks and yarn! I really heart the Hillside colourway - thanks for such a spectacular giveaway :) It is jillybean on Rav. I love concrete and tulips. I would love a skein of that colourway. :) I'm MeganSheWrote on ravelry. i'm so in love with hillside i could cry! As I have already purchased Concrete and Tulips and Skyline, how about Fingerpaint! I like the EARTHY HUES !Gorgeous yarn! All of the color ways are beautiful, but I think that I'd have to choose Concrete and Tulips as my favorite. Love how your socks turned out. I love all of the colourways, but my favourite would be fingerpaint, I think. My rav ID is: aebell. Thanks! Ooo! Gorgeous job on your socks!! I love the Concrete & Tulips and the Ocean Sunset too! 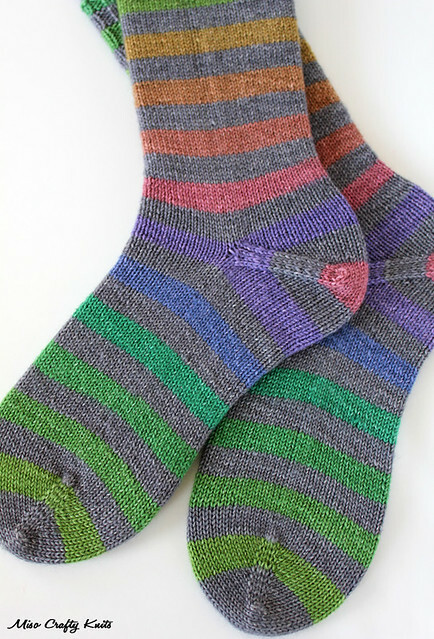 Loooove self striping and really want to try the finger paint self striping. No question, Skyline is my hands down favorite. I love blue, and with the grey it is just lovely. My goodness... the concrete & tulips is gorgeous as is the ocean subset and the spectrum! If I wasn't in full on save mode, they'd all be winging their way to me right this second! I love them all but I'd have to start with Warm and Fuzzy with the red accent.